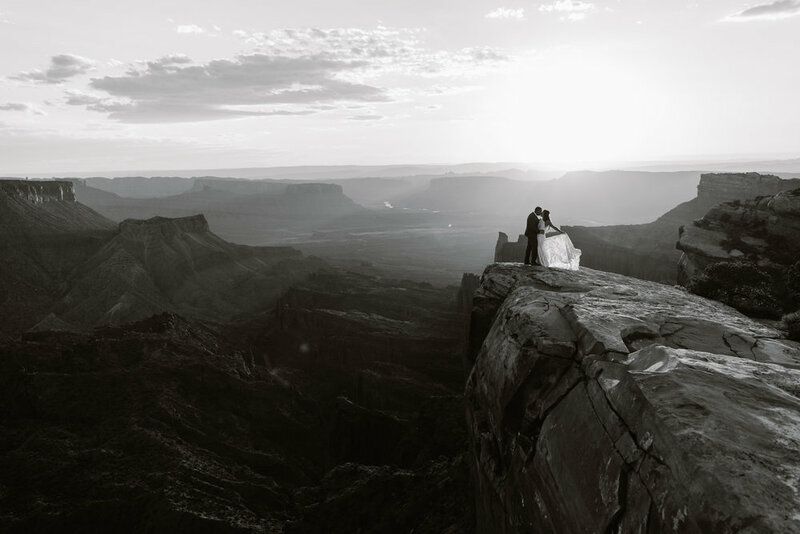 Jess stood on the edge of the canyon overlooking the valley below, the sun beginning its descent below the horizon in the distance, the trim of her wedding dress beginning to glow. I watched her move through my viewfinder, beautiful as any of the towers below. I barely gave her any cues - adventurous brides often seem to know exactly what to do, getting to a point where they are living completely in their own moment. 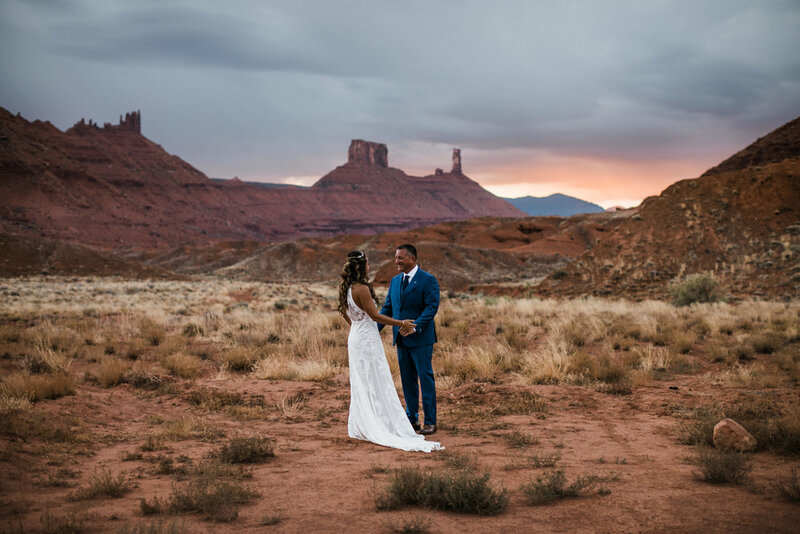 It was one of those breathtaking-goosebump-inducing scenes that always show up in Moab elopements where she looked back over her shoulder, a moment passing before her eyes turned upwards, her lips lifted into a smile, eyes pinched at the corners, and she let out a laugh. She had made eye contact with Troy, who had been fixated on her the entire time she was out there. His eyes were on her almost all day, and in the moments where he looked away for a moment at the valley or while talking to Callen or me, he would always look back to her with the same blown-away-by-her-beauty awe, the same as he had in their first look at sunrise. I cued Troy to go over (I would have felt guilty keeping them apart any longer) to sit with Jess near the edge of the cliff for the “one-shot” he had specifically asked for. As they sat together, the scene played out like a dream. I was struck with a sense of belonging Jess and Troy had, belonging to the spirit of adventure, to the landscape, and to each other - their presence like two towers meant to be next to each other for the rest of time. I was happy overwhelmed with how much Troy gushed about Jess in the emails and conversations before meeting them, and the whole day we had together, so I'll just use his words to describe their relationship early on, “The short answer is once we were able to spend some time together as friends, then as a couple, it became clear very fast that this is the person I want to spend the rest of my life with.” He went on about how their relationship progressed, “The easiest way to explain it is this: When I'm not with her, I want to be and can't wait until I will be again. When I can't be with her, I can't stop thinking about her. Many of my thoughts in the past were things I wanted to do and places I wanted to go... now I can't imagine any of this without her by my side”. 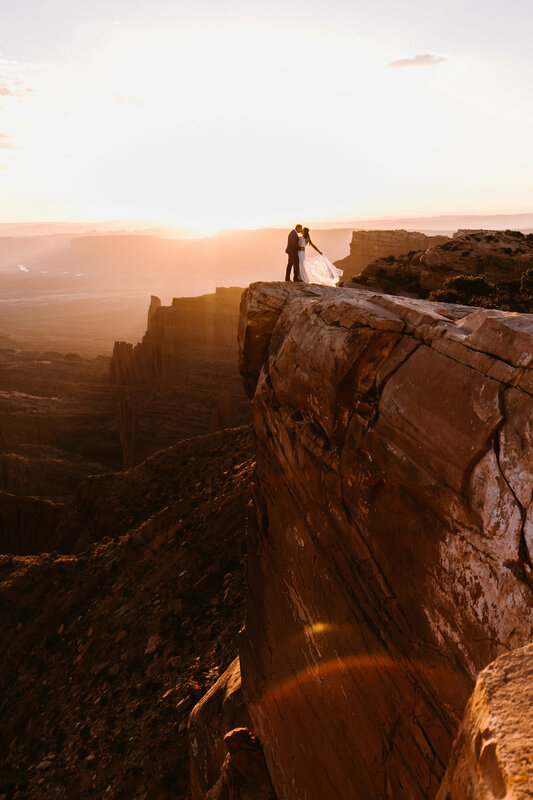 After hearing Jess and Troy's story on how they met and fell in love, it made sense how we ended up sitting on the edge of a cliff in Moab for their adventure wedding. They became friends while working for the same company for around five years but it was when they went Jeeping that they connected and realized there was more to their relationship. When it came to their wedding day, they were open to suggestions but wanted their day to be focused around their love for off-roading. 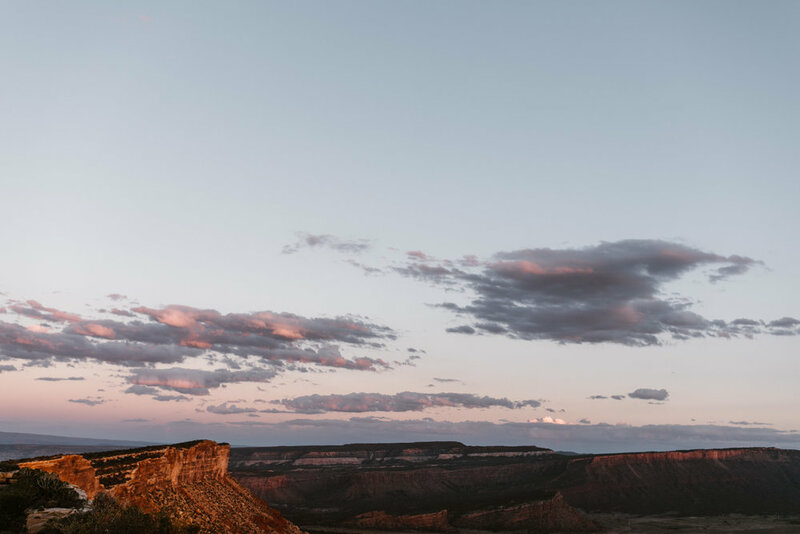 When they told me that, I knew exactly what area I want to take them to explore in, and specifically a section canyon rim to take one of the most adventurous elopement photos I've ever dreamt up (Jeeps count as a wedding party, right?). 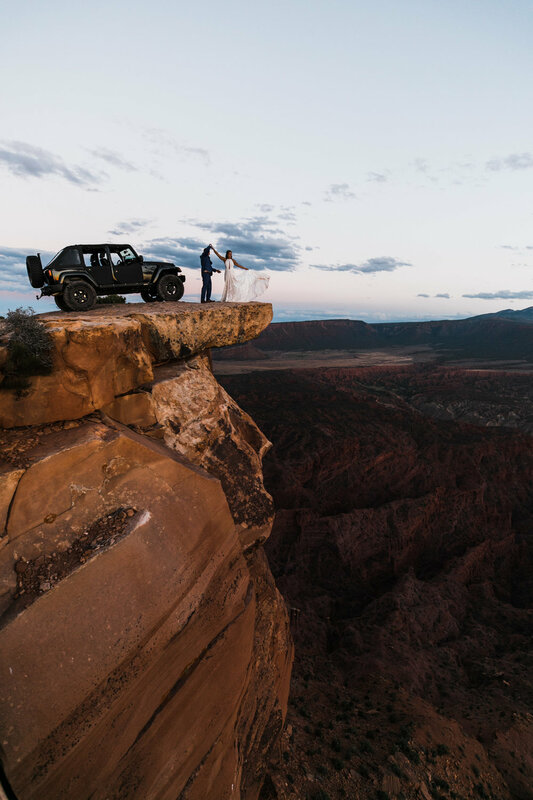 I was stoked on the idea of a Jeep elopement for a while, (these kinds of couples put a particular emphasis on the adventure part of our job title, for sure) with three hours of Jeeping through rough terrain, but if it was ever going to happen with any couple, it was Jess and Troy. That's what brought us the beginning of their big day, Troy using the side mirror of the jeep to get ready, and Jess using our camper as her own little bridal suite. Lesley Lind (who I've worked with a couple times (here and here) before and finally got to meet) came up to take care of hair and makeup. 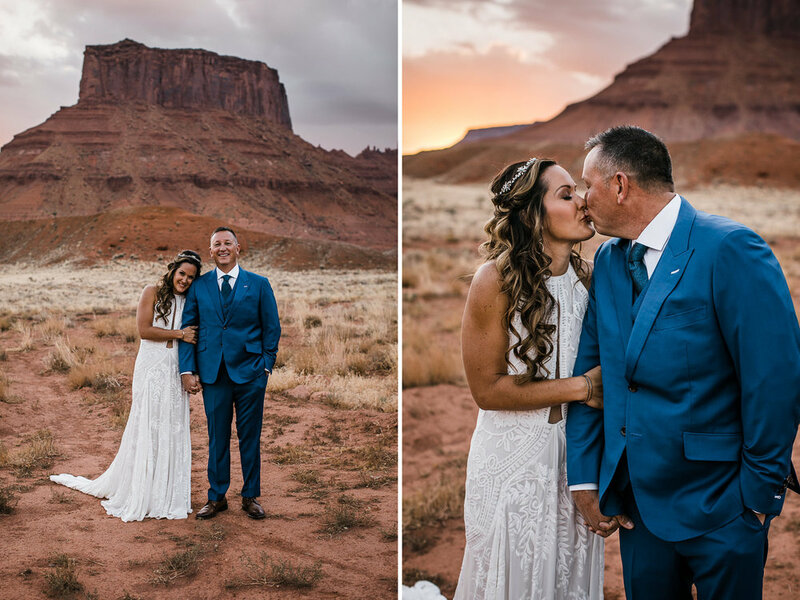 We did that first look I mentioned earlier at sunrise (I'll say it one last time, I'm obsessed over how much Troy adores Jess). 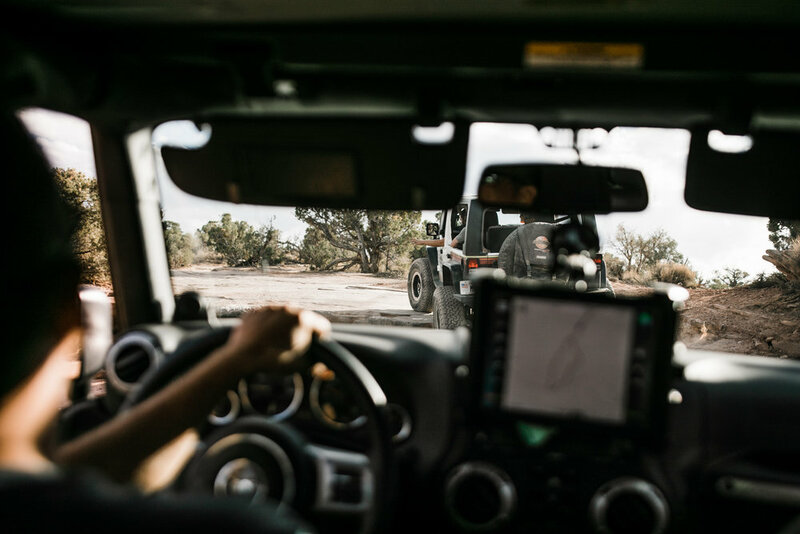 Honestly, it was all the adventure taking Jeeps far into the backcountry of the desert is cracked up to be, but a little easier than anticipated as Troy led the way, mobbing up giant slab steps, boulders, and some rough and tricky terrain. We love hikes and everything, but honestly, a huge bonus of this whole adventure wedding photographer thing is when you end up flying in helicopters or feel like you're in a car commercial raging up the side of a mountain in a Jeep. (Troy, you're seriously welcome to come back anytime as our personal driver for these sessions!!). We ended up in the middle of nowhere, so far from the beaten path. Something I love about photographing adventure weddings is the unknown beauty we'll encounter, even in places we've been before. We have a specific locations picked out for some shots of course, but there's always something that sticks out to the couple. Today, it was the exact place where Jess and Tony chose for their ceremony right then and there. They were probably the first people ever to get married in this spot. My brother and adventure wedding officiant, Conner, happily agreed to come out here to give a simple and meaningful ceremony before Jess and Troy popped champaign and subbed out cake for some cookies. The sun began to set which is when Jess stepped out to the edge. Let me take a step back here to be personally sentimental. 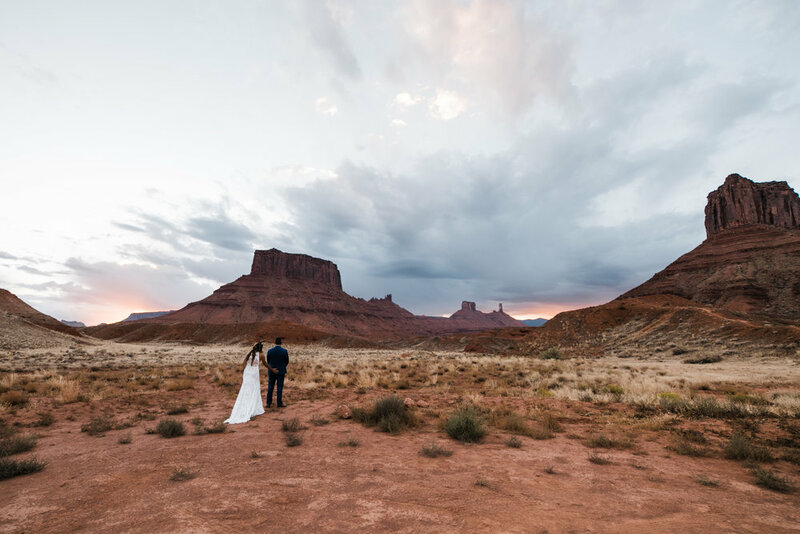 This year has been one of the best and also the most challenging of my life, and at this point in our career as adventure elopement photographers, Callen and I have done so much in the greater Moab area. We have photographed so many couples, countless engagements, elopements, weddings, sunrises and sunsets. We've experienced so many (but still only a fraction) of the hundreds of miles of canyon edges running high above these valleys. We have highs and lows in our life, our work means so much to us, and through it all our couples are there. This is all to say special is a hard thing to define these days, but seeing Jess out on that ledge, watching Troy and her move towards each other so gracefully, atop a place has become so dear and close to my heart, is special to me. It's special to see it become a place which will forever meaningful to another family. We gave them some time to themselves, snapping pics from a little further back, allowing them the space to have the thrilling memory of sitting on the edge of a cliff, watching the sun blink under the horizon and the light fade out. What I took from today, from being lucky enough to witness this love, are thoughts on what it means to belong and what it means to be together. When people think about the word together, images of people side by side or holding hands come to mind, others think of a bond, I just think of the way Jess and Troy looked at each other all day which can't really be defined, only captured. By sunset, they had had a thousand little moments, glances, and hand squeezes between the two of them that defined together, defined belonging. As it started getting dark, we loaded up the Jeep to head home. I reflected on how this desert is one of a few places which has stitched together a fabric deep inside of me. This place brings out what it means to be together, what it means to belong, I'm so glad for the way Jess and Tony brought themselves here to share and express their love. I'm so glad I was able to be a witness, to capture some of the beauty of such a rad day. These experiences are all so amazing, but I realized why this place, these people, and this job are all so truly special to me – in a place where you can go miles in any direction without seeing another soul, the vastness brings out the way the person next to you is special, it brings you together – getting to witness this makes me feel truly like Callen and I are some of the luckiest people on earth.